Ever since Judy Garland clicked her ruby slippers three times, audiences worldwide have been clamoring to return to the magical land of Oz. Based on the beloved classic novels by L. Frank Baum, Oz has been revisited in practically every creative medium imaginable. Films like Journey Back to Oz, Oz The Great and Powerful and Legends of Oz: Dorothy’s Return are just a sampling of the many motion picture follow-ups that have been released since The Wizard of Oz debuted in 1939. Television specials like Return to Oz, Tin Man, and The Witches of Oz continued to navigate the mythology in vastly different styles, as have countless books, comics, and video games. On stage, Oz has also been revisited in various incarnations. Based on Gregory Maguire’s series of novels, Wicked is the blockbuster musical that pulls back the Emerald Curtain on the secret backstory of the Wicked Witch of the West. Now starring two-time Tony Award-winner Judy Kaye, Wicked is a testament to the enduring legacy of the world Baum created so many years ago. The musical, which opened in 2003, just surpassed Rent to become the 10th longest-running show in Broadway history. The current national tour of The Wizard of Oz is an adaptation of the classic film, injected with new songs by the powerhouse collaborative efforts of Tim Rice and Andrew Lloyd Webber. And, of course, who could forget NBC’s spectacular live broadcast of The Wiz this past December? So since Oz is such a frequently explored place in our pop culture, it may seem a difficult task to create a piece of art that shows it to us through a truly fresh and innovative new lens. 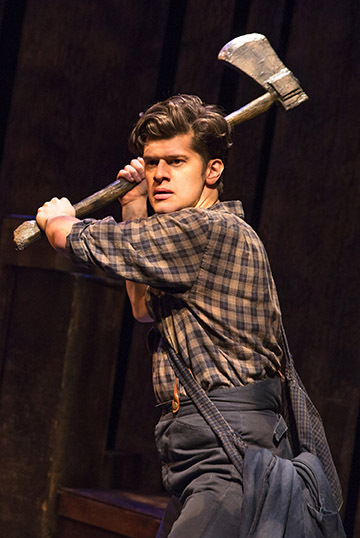 But James Ortiz, the creator, star, and co-director of The Woodsman, was more than up for the challenge. And the result paid off beautifully. 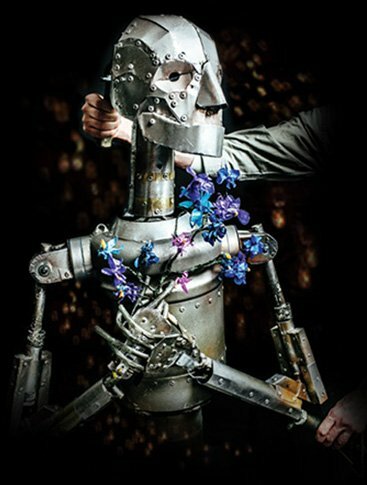 Now playing off-Broadway at New World Stages,The Woodsman is a breathtaking and unique look at the Tin Man. Told mostly through gorgeous puppetry and accompanied by haunting original music by Edward W. Hardy, the intimately presented origin story of the most beloved heartless man in Oz is a striking piece of work. Following its critically revered and sold-out engagements at 59E59 Theaters, The Woodsman chronicles the harrowing journey of a man who both literally and figuratively loses his heart when the life he has created with the woman he loves is ripped away from him by the evil Wicked Witch. With hardly any dialogue, the story unfolds through movement, allowing the puppets to convey the narrative in revelatory ways. With an eerie set that complements the dark and melancholy tone of the show, The Woodsman is a daring, unprecedented, stunning, and completely unmissable twist on Oz folklore. It is sure to shock, awe, dazzle, and inspire you.